The UW-Whitewater Warhawk football team is one of the best in the country. Their fans will now get to see more of their team with a brand new video scoreboard. The new board (pictured) boasts a Pro-Star VideoPlus Display that can show live and taped instant replays. The video board stands 39 feet high and 32 feet wide and also displays static and dynamic graphics. 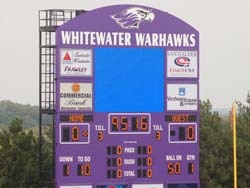 Fans next chance to view the new board is Saturday, Oct. 6 when the Warhawks face division rival UW-River Falls.